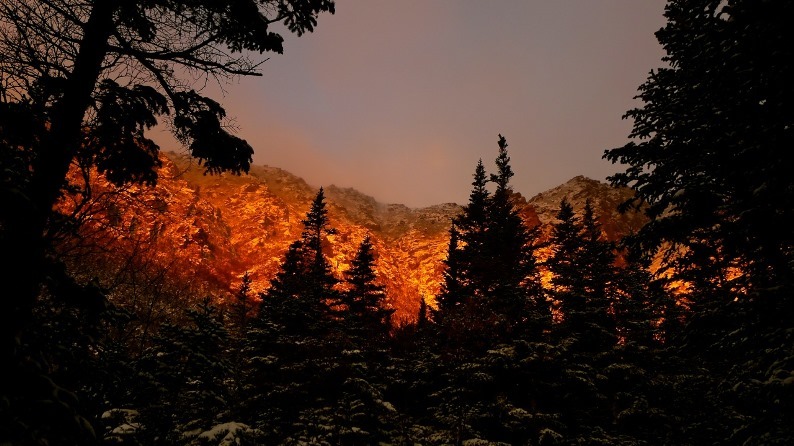 Early morning alpine glow in Huntington Ravine. October 19, 2015. On the day of the Black Dike ascent on October 19th, I was in Huntington Ravine to scope out what, if anything, had formed after only two days of below freezing temperatures. I chose a winding line up Yale Gully, avoiding the slab sections that had a coating of ice that was almost immeasurable to the human eye. Thin runnels of ice over rocky grooves kept me engaged and deep snowy drifts clinging to the upper sections made for a great winter day in mid-October. I wouldn’t say it was ‘first ice’ for me that day, but the adventure was well worth the effort. Fighting a blast of wind-driven snow midway up Yale Gully. October 19, 2015. After that weekend, the brief shot of winter died off and the thermometer climbed back up. For more than two weeks after, above average temperatures killed any hope for more ice. Tools and spikes were sharpened and ready to go. We all waited impatiently for that next cold spell. Winter tried again to beat back this warm Autumn with another two days of bitterly cold weather and high winds this past Friday and Saturday. And for those of us who went out on Sunday, we made that approach thinking it’s a 50/50 chance of climbable ice, at best. Were we just a bunch of dedicated fools? Perhaps. I rolled the dice in King Ravine, usually a good early season bet. 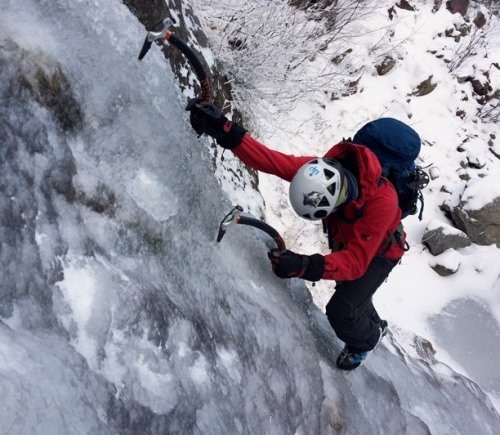 Zac St. Jules walked alone into Huntington Ravine as Max Forbes with his team, Russell Frisch and Steve Rahr started their own approach into the ravine under windy skies and cold morning temperatures. King Ravine was ready for me. My first swing into the drainage ice of the Great Gully was thin but sticky. Water was flowing underneath the ice, leaving a fountain at times where my pick had been. 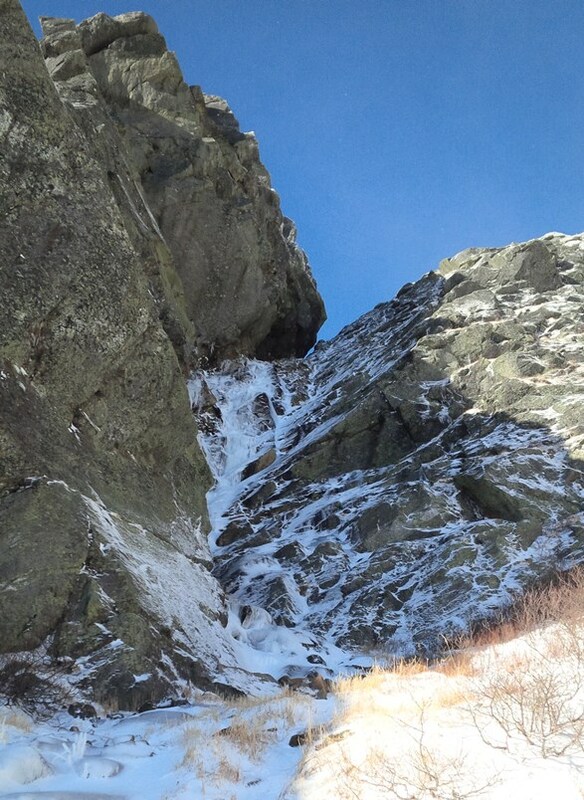 The ice ranged from just thick enough to almost too thin for comfort but it was secure and a total blast to climb. Above the ice, the snow began filling in the upper portion of the gully. Solid winter conditions greeted me at the top and underfoot I crushed thousands of rime ice feathers. The beginning of the drainage. November 15, 2015. 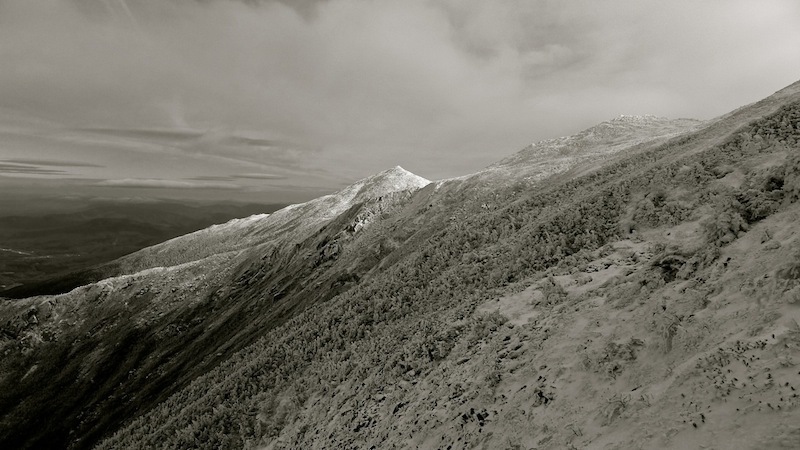 The top of King Ravine., looking toward Mt. Madison. Starting up the first ice. 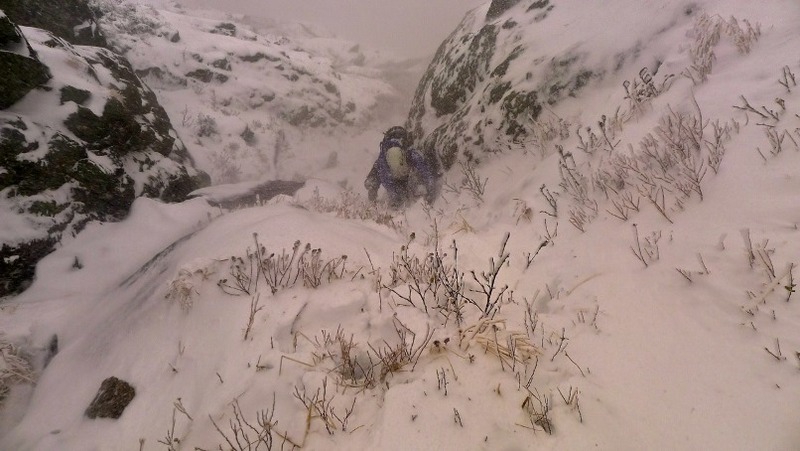 Meanwhile in Huntington Ravine, the high winds were forcing Zac to fight through some nasty spray from the open sections of running water midway up Pinnacle Gully. At the base of the climb, the party of three were about to head up the committing mix climb above them. Pinnacle Gully. November 15, 2015. Photo by Zac St. Jules. The final pitch. Photo provided by Max Forbes. The last pitch was pretty moderate, exclusively mixed climbing with patches of ice and hard snow that provided a bit more comfortable stance. More photos from the day here. P1 : Mostly well-bonded, thin unprotected ice. 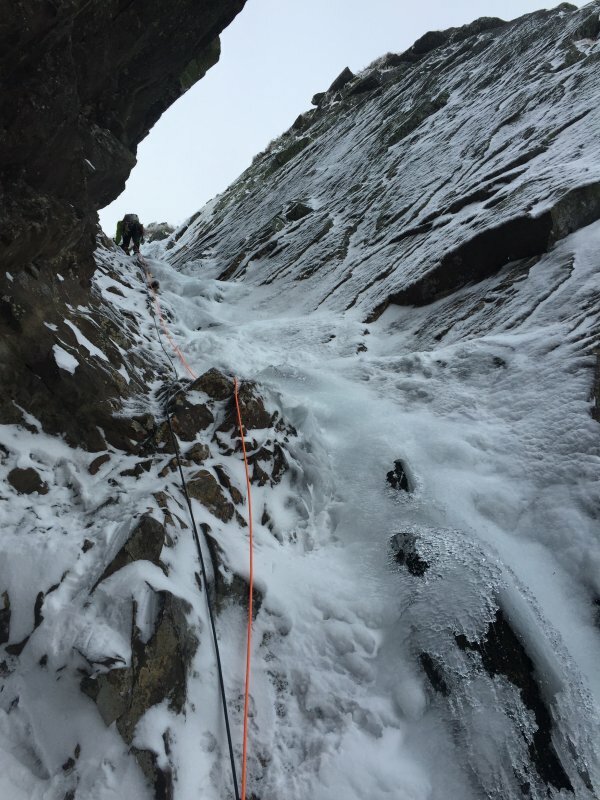 P2: Thin ice going up to the rock traverse, then no ice in the hose for 40ish feet. A little ice after the grade eases off, taking a stubby in places. 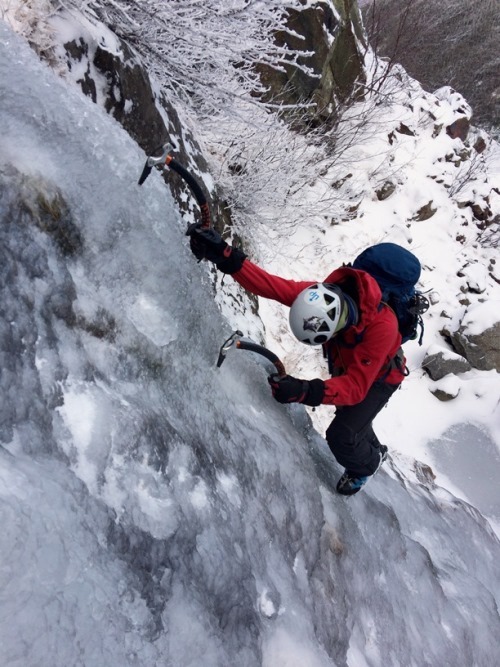 P3: Started out on ice, then after a short steep parasol capped headwall turned to mostly loose snow covered rock. While starting the third pitch, another party was spotted below. Winter is finally getting a hold of the mountains! Keep those metal bits sharpened! New Hampshire isn’t the only place where ice is forming. I bet some things are going down in NY and VT this week, if they haven’t already! 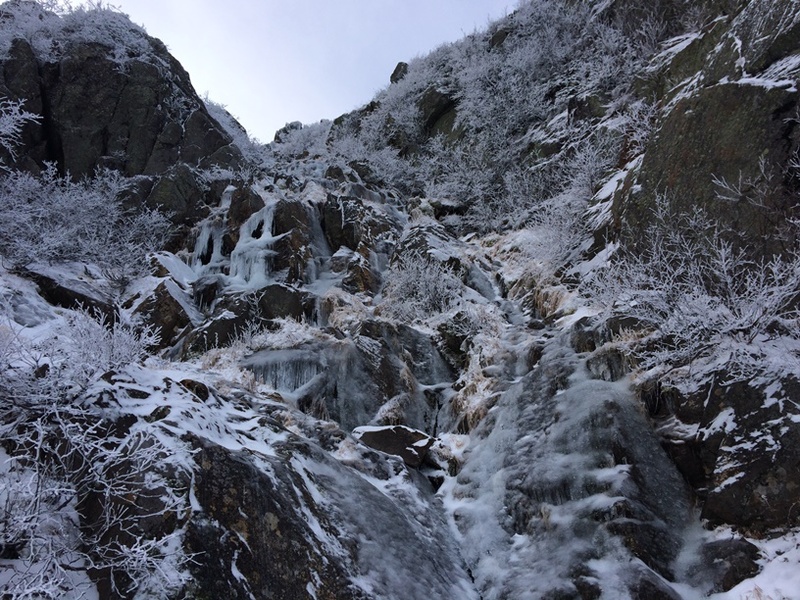 A wintry mix is forecasted for the higher summits on Friday night with blustery weather and snow moving in over the weekend, the ice season is well on its way! Check out the weather page for more info! Special Thanks to Zac St. Jules, Max Forbes and Noel Normandin for their photographs, video and additional words.